How would you perform the role of Antigone during her first scene of confrontation with Creon in order to convey your interpretation of the role to your audience? 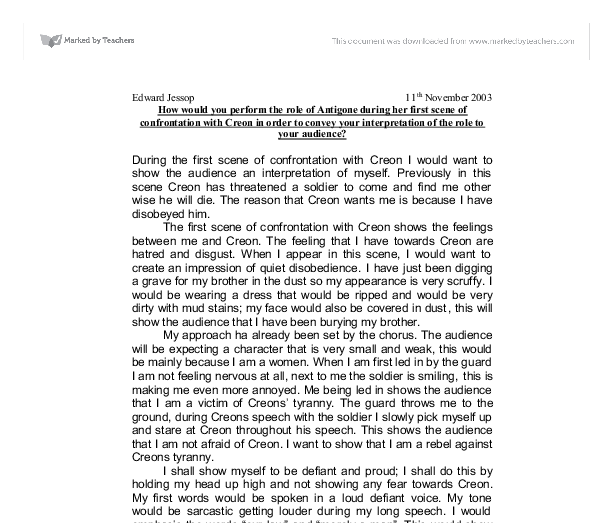 Edward Jessop 11th November 2003 How would you perform the role of Antigone during her first scene of confrontation with Creon in order to convey your interpretation of the role to your audience? During the first scene of confrontation with Creon I would want to show the audience an interpretation of myself. Previously in this scene Creon has threatened a soldier to come and find me other wise he will die. The reason that Creon wants me is because I have disobeyed him. The first scene of confrontation with Creon shows the feelings between me and Creon. The feeling that I have towards Creon are hatred and disgust. When I appear in this scene, I would want to create an impression of quiet disobedience. I have just been digging a grave for my brother in the dust so my appearance is very scruffy. ...read more. I shall show myself to be defiant and proud; I shall do this by holding my head up high and not showing any fear towards Creon. My first words would be spoken in a loud defiant voice. My tone would be sarcastic getting louder during my long speech. I would emphasis the words "our law" and "merely a man". 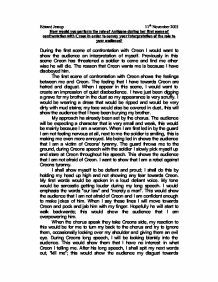 This would show the audience that I am not afraid of Creon and I am confident enough to make jokes of him. When I say these lines I will move towards Creon and pock and jab him with my finger. Hopefully he will start to walk backwards; this would show the audience that I am overpowering him. When the chorus speak they take Creons side, my reaction to this would be for me to turn my back to the chorus and try to ignore them, occasionally looking over my shoulder and giving them an evil eye. ...read more. I would try and show the audience that I hate the way that Ismene is trying to be courageous. This angers me even more for she is trying to say that she helped her brother when she didn't. When I am sentenced to death I am not worried because I know that I will be able to see my brother in the afterlife. I would not struggle with the guards showing the audience that I am an innocent party in the whole thing. During the first scene of confrontation with Creon I would try and get the audience on my side. I would try and give them a feeling of what I am feeling and try and get sympathy from them. I will try and show the depth of Creons tyranny and try to show that I am being accused for doing something that was right. He is the one who should be sentenced to death for leaving my brothers body with no burial. ...read more. From what Deborah says there it look like that her father represents the fun and happy part of her child life. From some things Deborah says we can see that her mother is a more practical figure who likes the idea of discipline we can see this in this quote, "If I sleep late my mother wakes me up. They have seen in the previous scene that Theseus easily loses his temper and can become very violent. I would now want them to be losing patience with him and his increasingly violent actions should ensure that they now don't feel very understanding towards him. However, above all, the social context is extremely important. The play is fundamentally English which addresses some very English issues. When Godber started writing the play the government and the citizens of Britain had really started to try and act due to drink. There had actually been many deaths in Britain, which had forced people to look at the problem of drinking in England. When Sentry is rambling on to Creon and when he says ?So I shouldn?t be punished for it, should I?? this shows that Sentry is trying to convince himself that he?s done no wrong, he?s only the messenger of this news, he had no part in the event. I would have a low booming voice, I would talk slow emphasising certain words by saying them louder and slower, however when getting annoyed I would speed up showing my anger rising. The costume is typical for ancient Greece, men often wore knee length chitons whereas women wore them full length. Betterton is playing Cornet, the ladies maid. Again, this is significant to the decline of her acting. She is no longer the biggest part but a very small and insignificant one with not many lines. However, the lines she has got, she should say in a very restoration style of acting.